Crystal Racing Enterprises and Contreras Stable's Matrooh motored home in Saturday's 66th running of the Grade III $100,000 Hanshin Cup to give trainer Cipriano Contreras and jockey Santo Sanjur the first graded stakes win of their careers. Run for the 24th year as an exchange race with the Japan Racing Association, a field of nine went to post in the one-mile event over the main track. William Stiritz's Goneghost lugged in at the start but recovered and raced out for the lead with an opening quarter of 23.95 under rider Chris Emigh. The Scott Becker trainee felt some pressure in the early stages but continued to run strong through fractions of 46.54, 1:10.96 and 1:23.58 while putting distance between himself and the rest of the field. Sanjur sat patiently on the eventual winner, opting out of the running early then began to make up ground on the final turn. Coming into the stretch Matrooh was angled to a clear path and closed quickly in the final stages to secure the win by 2½ lengths in a final time of 1:36.43. Goneghost settled for second, five lengths better than Double D. Stables' Western Elegance, who had a troubled trip under Jose Lopez but closed well for trainer Liane Davis. Wesley Ward-trained Master Merion was bet down to the post-time favorite, but Vivienne Day and Kate V. Rose's turf-stakes winner had an awkward start under Corey Nakatani, who had flown in from California to ride. After recovering from the break, the duo tried to match stride with the pacesetters but had to settle for fourth. Matrooh, an 8-year-old gelding by Distorted Humor, won for the 8th time in 23 lifetime starts and earned $57,600 to boost his career earnings to $477,029. He returned $19.60, $9.20 and $6.20, with Goneghost paying $4.80 and $3.60. Western Elegance returned $7.80. Great Wide Open (IRE), Ghost Hunter, Christian C, Harmac, and Crewman completed the running order. Wellabled was scratched. 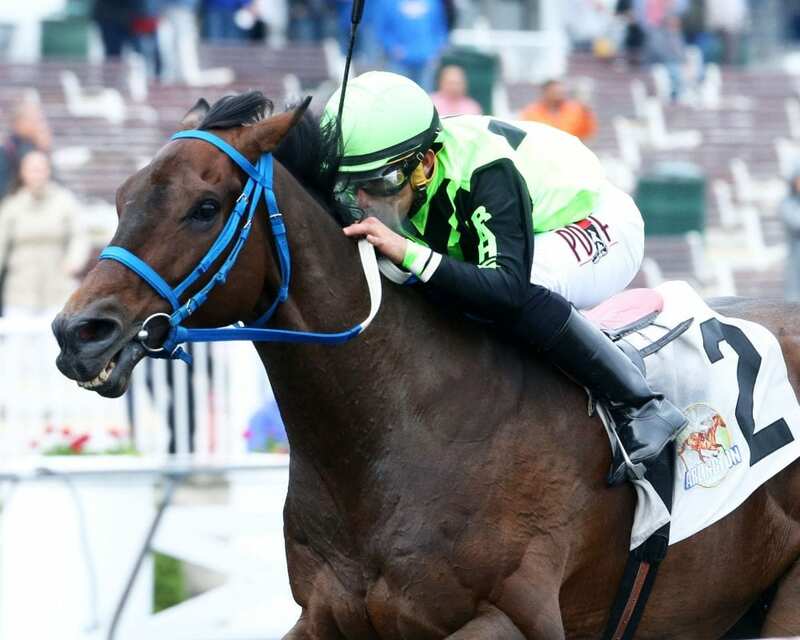 This entry was posted in Racing and tagged arlington, Arlington Park, Chris Emigh, cipriano contreras, Corey Nakatani, distorted humor, Hanshin Cup, matrooh, santo sanjur by Press Release. Bookmark the permalink.